Research shows that the queen sweat bee determines the role of the female brood by controlling its food. First generations of the nest are restricted food so that the bees will grow to be workers rather than reproducers. The bees are small in size (about 1/4 to 1/2 inch or 4-10 mm). And are known to sting when agitated. The pain of a sweat bee sting is minor but can be complicated and even deadly to persons allergic to bee stings. Most bees in the Halictid family forage and are active at dusk or in the early evening. Also, their social structure is considered "eusocial". Cooperative brood care - The whole nest help in caring for the young. Division of labor - work responsibilities in the nest are distributed among the population based on reproductive capabilities. Queen sweat bees 'choose' the role of their daughters, according to a new study published in BioMed Central's open access journal Frontiers in Zoology. The amount of food provided for the developing larvae determines whether the daughter becomes a worker or a new queen. 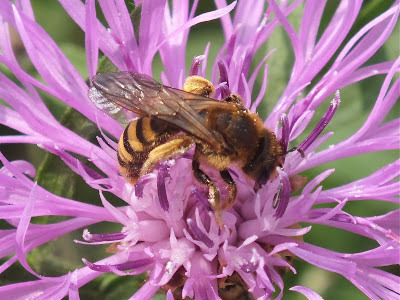 The sweat bee Halictus scabiosae are a primitive eusocial insect. Eusocial insects have a hierarchical society with a division of labor between reproductive queens and males, and workers. However for H. scabiosae all the adults have retained the ability to reproduce, although their role in the nest may preclude active reproduction. Foundresses, large queen bees which have survived the winter, set up a new nest in spring. The first generation of offspring are usually smaller bodied female workers, which then help the queen in raising the next generation of reproductive (larger) females and males. However the first brood daughters may also reproduce either within the nest or after dispersing to other nests. Researchers from the University of Lausanne investigated whether mothers restrict the food available to their first brood in order to ensure that they become workers because they are small sized, possibly easier to dominate, and so less likely to reproduce. They found that the total amount of pollen and nectar supplied to the first brood was significantly less that to the second brood – in fact the second brood received 1.4 times the amount of provisions than the first. However the amount of sugar provided to the two broods was approximately the same, meaning that the second brood had proportionally more pollen. Over the two years of the study it became apparent that first brood females were always smaller than second brood females, both in terms of head size and fat reserves, but first brood males were not necessarily smaller that the males from the second brood. Nayuta Brand and Michel Chapuisat who performed this study suggest that this is because the foundress is 'choosing' to feed her first generation of daughters less. Dr Chapuisat explained, "Although it is hard to distinguish parental manipulation from resource availability and resource acquisition, which are influenced by vegetation, weather, seasonal variation, numbers of foragers and more, the fact that we were able to see that first brood female body size remained constant despite pronounced differences in weather strengthens our argument that the foundresses restrict the food of their daughters to drive them into the worker role."